Yes that’s right. I took an English Classic and gave it a Greek twist. Although most say, ‘don’t fix what aint broken’…sometimes it’s refreshing to take a classic and turn it on it’s head. I created this recipe one lazy Sunday at home. It received warm reviews, even from my Yiayia (Grandmother)! And that’s saying something. Pre-heat the oven 190C/fan 170C/gas 5. Add the flour and diced figs then fold. 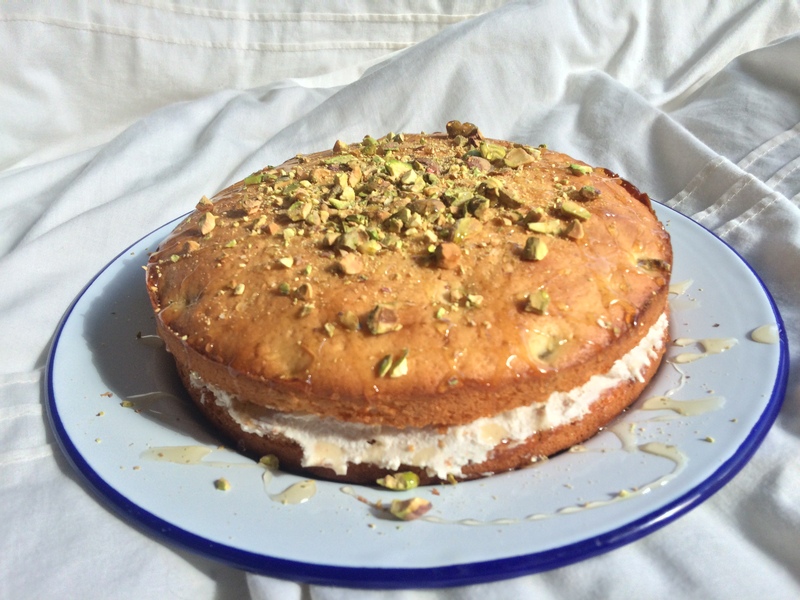 Drizzle the honey all over the sponge and sprinkle on the pistachio nuts. Voila! Now share with your friends and family. Afternoon tea will never be the same.